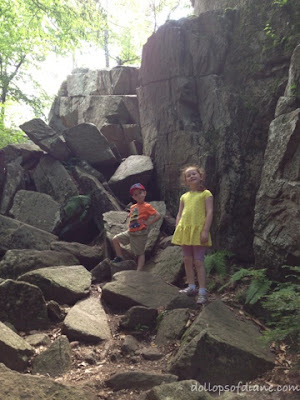 A few people have mentioned to me how much they like Purgatory Chasm State Reservation in Sutton, MA. 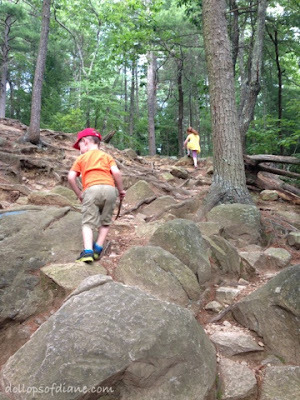 I checked the website and it said that hikers should be sure footed and aged 6+. So like any great parents would do, my husband and I packed up our 5, 4, and 3 year olds and headed off to the wilderness! We had a great time and the kids LOVED it. However, it was definitely challenging for us at some points. The first 1/4 of a mile is through the actual chasm which has granite walls 70 feet tall at some points. 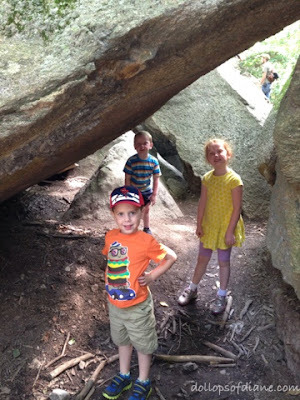 It is full of enormous rocks that you need to climb over or around. At multiple points we were pretty sure that one of the kids would break a leg or smash their head on a rock, but we made it out injury free! We did have to pick Daniel up a couple of times to place him over large boulders that he couldn't make it over on his own. All in all though all the kids did a great job. The second quarter of a mile is still rocky but no where near as difficult as the first which was nice. After we finished our hike,we headed over to the playground that the kids loved. We played there for a while before we started feeling raindrops which was a great excuse to get the kids in the car. They never would have wanted to leave! Other park info: There are several trails in the park so you can make your experience as easy or difficult as you choose based on your skill level. There is an information center with indoor bathrooms and portapotties outside as well. There are plenty of picnic tables and outdoor grill areas for people to take advantage of. Parking is free. Have you been to Purgatory Chasm before? It's definitely a place we'll explore more as the kids get older!